1979 was a banner year for the Guardsmen, the northwest suburban Chicago corps that popped into the World Championship Finals in 1976, the year a commercial filmed by the members for Kentucky Fried Chicken was frequently broadcast throughout the country. Back in the USA Bicentennial year of 1976, the second day of the DCI World Championships in Philadelphia was held earlier on the same day of the Finals. 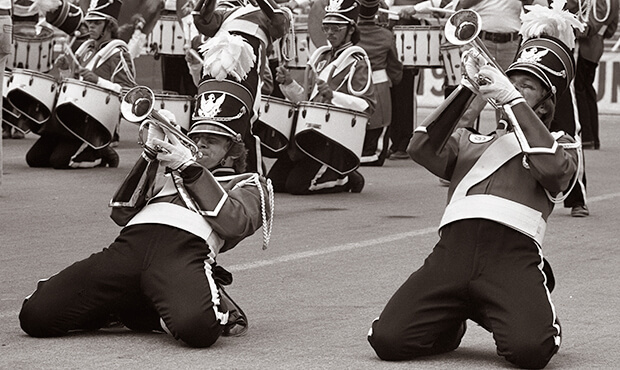 The top corps from 1975 performed the day before and it was generally thought this would give those corps a chance to rest up a day before Finals. However, Guardsmen, the final corps on the field in Prelims, were about to have the performance of their lives and tied for 10th place. Along with the Bridgemen, the corps was swept into Finals later the same day. Perhaps exhausted from performing two shows so close together, the Guardsmen dropped 9.50 points in the Finals, finishing 12th. The next year, the corps seemed like a lock for a Finals berth in Denver, but finished in 16th at the Prelims in Boulder. This was especially hard for the members to deal with as the corps had bested its fellow suburban Chicago Cavaliers seven times during the season. The Cavaliers popped into eighth place in Prelims after being the 18th corps to break 80 points at the show immediately preceding the World Championships. With perhaps the tallest shakos in drum corps history, the Gaurdsmen bounced back to place 11th in 1978 and 7th in 1979. The corps shocked a number of groups in 1979 with a season that started out fairly lackluster and slowly kept improving at a rate that didn't arouse much suspicion among those other corps. On June 9, the corps scored 13.6 points under the Madison Scouts and on Aug. 17, the day of the DCI World Championship Prelims in Birmingham, Ala., the corps placed 10th to the Scouts' 6th place. But if the corps peaked in Prelims in 1976, it made up for that by peaking in Finals in 1979. That year's Finals was a "perfect storm" of opportunity for the Guardsmen as the corps passed up the Scouts, (who fell to eighth, 0.80 behind) and also passed North Star and Blue Stars to pop into seventh place with a score of 85.30. The caption numbers clearly show why: The corps took third in General Effect Brass, only 0.30 under Blue Devils' perfect 10.0 and just 0.10 under the Brass score for Spirit of Atlanta. Percussion GE took fifth and despite 10th place in Visual GE, the corps finished sixth in total GE. The brass section took fourth, combining fourth in Brass Performance and third in Brass Musical Analysis; enough to neutralize the 10th place finish in Total Percussion. The 1979 show started with Hugo Montenegro's "Fanfare for the New," the opening selection on the landmark album, "Stan Kenton Conducts the Los Angeles Neophonic Orchestra." The shocking clarity of the crisp articulations in the piece, as delivered by the horn line is a treat. The line's instructor was a relative unknown by the name Tim Salzman, who later went on to instruct Santa Clara Vanguard and eventually instruct and arrange for the Cavaliers. The extreme syncopation and jazz articulations of this work is a vivid indicator of just how good Guardsmen's horn line was in 1979. The next piece was the concert standstill number of John LaBarbera's "Tiger of San Pedro," popularized by jazz trombonist Bill Watrous. This was a time when corps still essentially stood still during the concert production, with some movement between sets. The work clearly indicates that had the staff decided the corps was going to specialize in jazz, it could have been quite successful with the new identity. This work was also a great showpiece for Bill Harty's color guard, who was becoming one of the top units in Winter Guard International competition during the corps' off-season. A percussion feature of "Overture to Russlan and Ludmilla" by Mikhail Glinka ended with a sequential rifle toss over the contras. One can only imagine the reaction of corps director Ray Harty when he first saw that in rehearsal, mentally counting up the cost of each contra as the rifles spun overhead. A short intro of Sir William Walton's "Henry V" (written for the film of the same name) was far more in character with the British themes for which the corps became known and which inspired its uniform design. This led into the closer of "Greensleeves," a traditional ballad that allowed the horn players to relax a bit and fill out the bores of their instruments with some of the most luscious sounds heard during the first decade of DCI's existence. The show ended with the color guard cavorting around a maypole and the brass players reaching into their souls and finding a great deal of volume that they determined would not be left on the field at the end of the season. It would have been fascinating to see the Guardsmen continue on the trajectory that led them into the 1979 season. 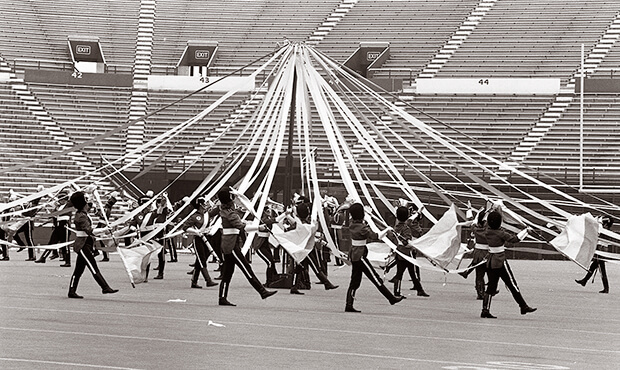 The 12th place finish in 1980 was the last year the corps would place in the Finals. Two years later the corps finished in 32nd, followed by performances in Division II & III competition until 1994. This week only, you can save on 1979 World Championship Audio and Video Performance Downloads on the DCI Fan Network. Buy the 1979 Guardsmen Video Performance Download. (Available this week only for $3.99. Regular price: $4.99.) Buy the Audio Performance Download bundle of all 12 Finalists from 1979. (Available this week only for $15.99. Regular price: $19.99.) Offer ends Monday, March 14 at 8:30 a.m. ET.